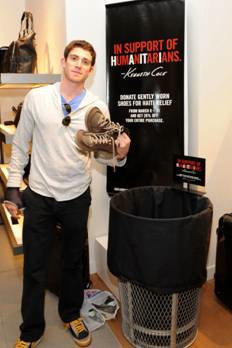 Bryan Greenberg and Victor Rasuk from HBO’s How to Make it in America stop by the Kenneth Cole store in Los Angeles to donate shoes to Haiti relief efforts. March 2010 will mark the 20th year of Kenneth Cole’s annual national shoe drive. Kenneth Cole has partnered with Soles4Souls to help those affected by the crisis in Haiti. All shoes will be donated to Soles4Souls who has partnered with organizations on the ground in Haiti to transport and distribute the aid.